The Hufflepuff hourglass in the Hogwarts Entrance Hall for recording House Points is filled with yellow diamonds (JKR:Tw, Pm). Fred and George gave their mother Molly "a brand-new midnight blue witch's hat glittering with what looked like tiny starlike diamonds" for Christmas in 1996 (HBP16). A sign on the Firebolt in Quality Quidditch Supplies said the ash handle was "treated with diamond-hard polish (PA4). Fleur Delacour describes the Christmas ice sculptures at Beauxbatons as "huge statues of diamond, glittering around ze place" (GF23). When Wormtail heated the cauldron for Voldemort's rebirth, the surface of the liquid "was alight with sparks" as though "encrusted with diamonds" (GF32). 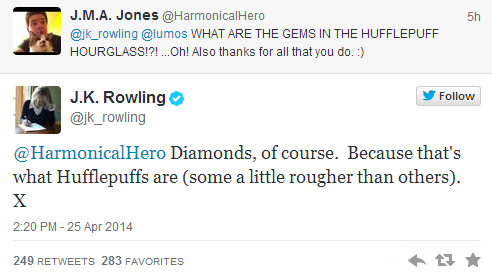 When JKR was eleven, she wrote a series of stories about people who owned seven cursed diamonds (JKR:FAQ). J.K. Rowling told a fan on Twitter that the Hufflepuff hourglass is filled with diamonds because members of that house are "diamonds in the rough" - a phrase meaning "full of potential."